The details of the performance of the nation’s children were announced today by Minister of Education, Nicolette Henry at the National Centre for Education Resource Development (NCERD). 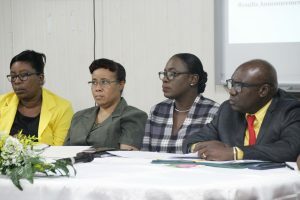 Minister Henry reported that grades one to three passes in both English A and English b improved in 2018. She said that English A recorded a pass rate of 67.14% in 2018 whereas in 2017 the recorded pass rate was 57.99%. This year, the English B pass rate was 78.6% as compared to 44.45% in 2017. Moreover, the performance in Mathematics also improved with a pass rate of 43.39% in 2018 as compared to 39.23% in 2017. In the area of Additional Mathematics the pass rate remained constant with 68.45% in 2018 when compared to 68.61% in 2017. Further, Minister Henry said that for CSEC there have been improved performances in 16 subject areas. These subjects that experienced improved performance are: Biology, Chemistry, English A, English B, Geography, Information Technology, Mathematics, Office Administration, Physics, Social Studies, Spanish, Visual Arts, Human and Social Biology, Textiles Clothing and Fashion, Technical Drawing and Industrial Technology (Mechanical). For CAPE, the subjects that recorded improved performances were Accounting (Units 1 and 2), Applied Mathematics (Unit 1), Biology (Unit 1), Chemistry (Units 1 and 2), Economics (Unit 1), History (Units 1 and 2), Law (Unit 2), Literatures in English (Units 1 and 2), Management of Business (Units 1 and 2), Physics (Unit 1), Sociology (Units 1 and 2) and Tourism (Unit 1). The top 10 students for CAPE are Aadilah Ali (Queen’s College 8 ones), Michael Bhopaul (Queen’s College 8 Ones), Sariah Singh (Queen’s College 7 Ones 2 twos), Rajiv Muneshwar (Queen’s College 7 Ones), Rawletta Barrow (Queen’s College 6 Ones, 1 two), Dalip Jeevan (Queen’s College 6 Ones), Min Wen Gong (Queen’s College 6 Ones, 1 two), Fatima Karim (Queen’s College 6 Ones, 1 two), Jamie Yearwood (Queen’s College (6 Ones), Farah Chin (Marian Academy 6 Ones). According to Chief Education Officer, Mr. Marcel Hutson, all of Guyana’s children are gifted and it is the responsibility of the Ministry of Education to tap into those talents using the required methodology. He said that there is a sense of greater passion within the Ministry which is being generated through collaboration with teachers, students and parents who have been working assiduously to ensure that there is movement in the education sector. He said that the Education Sector is not where it needs to be but he assured that systems are in place to take the sector to a place where it can achieve all it has set out to achieve.